Mar 9 When was the last time.....? In today's world we all have way too much on our plates. Inevitably things fall through the cracks or get put on the back burner. Unless you have a mind like a steel trap, I bet you can relate to this. I really love keeping a home, working towards a Practically Perfect home is my goal. With that in mind, perfection is an illusion that is impossible to reach. I find that if I keep things organized and look for solutions to make our home run a little smoother I can get closer to that goal. Have you ever thought to yourself...."when was the last time I changed my sheets or my towels, a week ago, maybe longer?" Or wondered, how often should I wash my pillows? A while back, I came across the chart below while researching home hacks and at a glance it is a great guide. I paid particular attention to the household cleaning guides. Above you see that washing your shower curtain liner every three months is recommended. There is nothing worse than getting into a shower with a moldy, dirty shower curtain liner. The traditional vinyl shower curtain liners are the worst. They are stiff and are not very easy to wash. Therefore you might just overlook the idea of washing them. 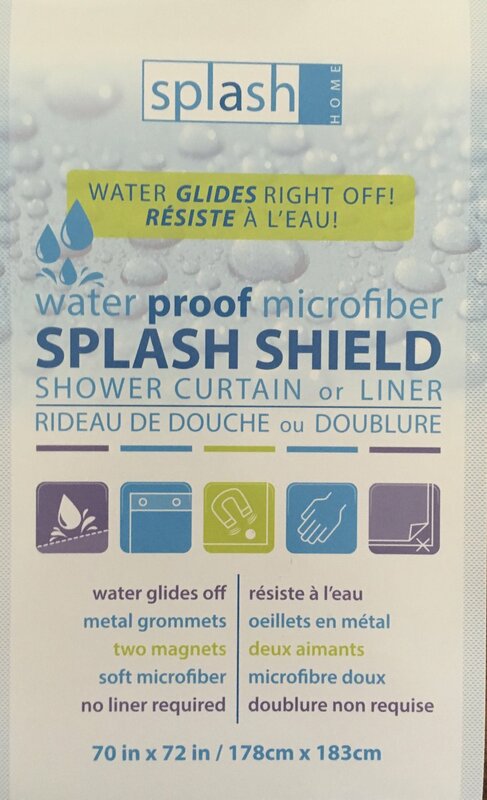 As an alternative, I have been a fan of washable fabric/microfiber shower curtain liners for years. They can be found at Bed, Bath & Beyond, Homegoods and the like and of course online. Pop them in the washer every couple of months and hang them back up to dry, no need to put them in the dryer. Quick and easy. They average about $12 and you will have them for years if you wash them regularly. In the end, cheaper than the vinyl ones that get so gross you throw them away! I recently saw a piece on tv that talked about the bacteria that is found on an average dish towel. I have to admit I have been guilty of using mine for several days. Never really thought about it until I heard this. So out I went and bought another stack of dish towels and now I just make a habit of throwing them in the hamper as often as every day. I am even getting better about putting my wet kitchen sponge in the microwave for 90 seconds to sanitize that every day or so. With the stomach flu flying around, why not? Someone I know uses the days of the week as a marker to remember when it is time to wash certain things. I have adopted their strategy as well. Towely Tuesday and Sheety Saturday...works for me. On Tuesdays when I am doing my towels, I have added the quick and easy task of washing my makeup brushes as well. Yup, saw another segment on that too! I know I am sounding a bit like a germaphobe but it does make sense. You are just using the same brush over and over putting any bacteria on the brush back on your face. Cleaning your face every morning has just been sabotaged by a dirty powder brush. Same theory with any brush that applies eye makeup. So grab that shampoo bottle, wet your makeup brush and gently wash it in the palm of your hand and rinse well. Whatever you use your brushes for, the color will come streaming out and all that is left is a clean brush to be used the next day. Shake it well and lay it on a clean washcloth to dry. Just like new. While you are at it, throw that toothbrush in the back compartment of your utensil holder in your dishwasher and say goodbye to those germs too! I realize all this might sound like more work to you, but honestly once you establish a routine, it will happen very naturally and you will be closer to that Practically Perfect home. Finally, a shout out to Bitmoji for helping me create my crazy emoji above. Check it out, you might just find yourself lost in finding the right shape eye, hair and seasonal outfit. The options and messaging will keep your friends and family entertained in your text messages. Sometimes you just can't take life too seriously!